Can you tell what this melted blob of steel and despair used to be? There’s a hint in the title. And maybe you can guess from the wheels. If you haven’t already seen it elsewhere or figured it out from my crappy hints, this leg of Kentucky Fried Chicken was once a glorious 1996 Porsche 911 Carrera 2, as listed on Bring A Trailer. It rather obviously died in a hot, hot fire. The seller has started bidding for the heap of nothing at just $60 bucks, and the estimated “repair costs” are just around $195,000. The original listing for the car is in the Detroit, Michigan over on Copart.com. 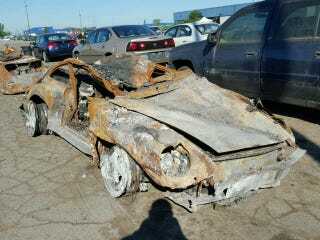 That car is listed for only $55,200 if you don’t have the $195,000 to restore the burnt potato chip up there. Next time someone should get 911 on the line sooner. Bring a trailer, or maybe just an urn.